mmsonline.com DIGITAL EXTRAS MMS AUGUST 2018 16 mmsonline.com mmsonline.com GALLERY Machining Technology Spotted at Amerimold 2018 Editor Julia Hider chronicles some of the mold machining technology displayed at this year's event back in June, ranging from automation to CAD/CAM. 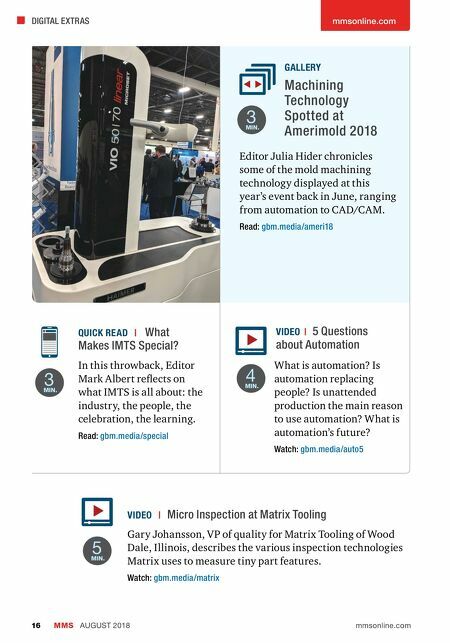 Read: gbm.media/ameri18 Gary Johansson, VP of quality for Matrix Tooling of Wood Dale, Illinois, describes the various inspection technologies Matrix uses to measure tiny part features. Watch: gbm.media/matrix VIDEO | Micro Inspection at Matrix Tooling VIDEO | 5 Questions about Automation What is automation? Is automation replacing people? Is unattended production the main reason to use automation? What is automation's future? Watch: gbm.media/auto5 In this throwback, Editor Mark Albert reflects on what IMTS is all about: the industry, the people, the celebration, the learning. 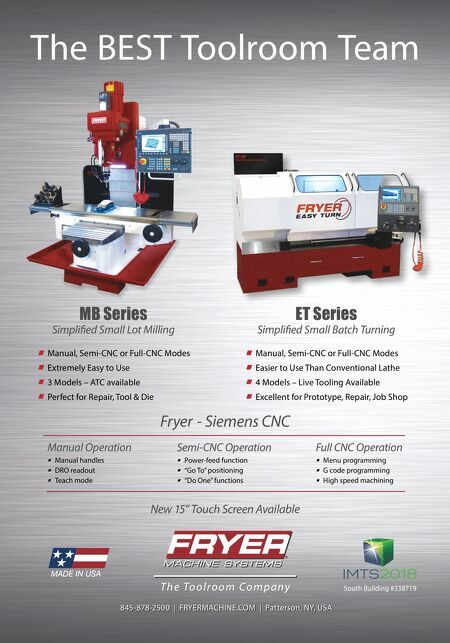 Read: gbm.media/special QUICK READ | What Makes IMTS Special? 5 MIN. 3 MIN. 4 MIN. 3 MIN.